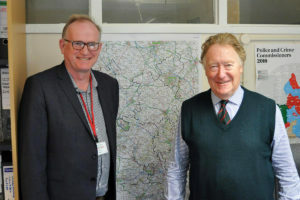 In the first instance, the Forum helps Thames Valley Police perform its statutory obligation to consult locally and set neighbourhood policing priorities for the Chiltern district, comprising Chesham, Amersham, the Chalfonts and the Missendens. Quarterly meetings, open to all, are held to set local policing priorities. Beforehand, residents are invited to express their views and preferences through an online survey. A separate survey is held for young people. These help inform decisions on priorities taken at the meeting. The meeting is also an opportunity to meet members of the neighbourhood policing team, and for informed discussion on policing and crime. “The Community Forum is vital to the neighbourhood policing team, not only to help identify which issues the community feels are impacting upon them most, but also to prioritise them and help identify where the community can play their part and work with us, our statutory and voluntary partners, to help to address those concerns.” Inspector Richard Vine. Through its website (www.chilterncommunityforum.org) and growing Twitter presence (@ChilternForum), Chiltern Community Forum seeks to spread the word on matters important to individual and community safety, ‘join the dots’ between needs and community support organisations, and point visitors in the right direction to report or request assistance for crime-related and other concerns. In part, the need for the sort of community involvement encouraged by the Forum reflects the reality of over £100 millions of cuts from Thames Valley Police’s annual budget since 2010/11. But it’s also another example of the UK’s extraordinarily strong ‘third sector’, without which all our communities would be so much poorer. Initiatives such as Chiltern Community Forum are not just welcome, but necessary to complement the work of neighbourhood policing teams. If you have any suggestions or queries, or wish to support the work of the Forum in any way, you can contact the forum on contact@chilterncommunityforum.org, or speak to Andy Garnett.